All dispatch times detailed are working days only which are Mon-Fri and exclude statutory and advertised holiday closures. Please note that these are approximate average dispatch times. See below for further explanation on dispatch times. All ready made cabinets are available in stock unless otherwise detailed on the ordering page. Please note however that we do not routinely dispatch orders on Fridays. If you are likely to be away from home around the time delivery is anticipated (or at any time between ordering and anticipated delivery as orders are occasionally dispatched earlier than indicated), please ensure that you advise us by email after placing your order and we will ensure that no products are dispatched to you for the time you are away. Please note that due to restricted space, we are unable to store orders. We will arrange delivery of the products you order by independent carrier service to the address on your order (this will be the address registered to your payment method). Please note that you are responsible for ensuring that the correct address and postcode is given when placing the order as we cannot be held responsible for any losses or other expenses incurred as a result of mis-delivery owing to incorrect addresses and postcodes. A valid signature will be required on delivery. We cannot request deliveries to be left without signature as our contract with the carriers insists that a signature is obtained although you may leave a signed note for the driver requesting this and he MAY be willing to do so (please ensure the driver is able to take the note away with him). The drivers do have discretion to leave parcels without signature but this must not be relied upon as this is discretionary only. When your Products are dispatched we use a next working day independent carrier service for most items in an attempt to provide you with more certainty of the actual delivery date. We are unable to telephone to advise of or to organise deliveries. Scotland should allow up to 3 working days for delivery (5 for Highlands and off-shore addresses). Please note that we do not routinely dispatch orders on Fridays. We are unable to specify actual delivery times or arrange Saturday deliveries. If you are likely to be away from home around the time delivery is anticipated (or at any time between ordering and anticipated delivery as orders are occasionally dispatched earlier than indicated), please ensure that you advise us by email after placing your order and we will ensure that no products are dispatched to you for the time you are away. Please note that due to restricted space, we are unable to store orders for any UK manufactured covers and these must be dispatched as soon as they are complete. Therefore for UK manufactured orders in particular we must be informed at the time of ordering if you are likely to be away so that we can alter the manufacturing/finishing schedules accordingly. Please bear in mind when specifying your address for delivery that deliveries are only made during working hours and days (Monday to Friday excluding statutory/bank holidays). The next working day service is NOT GUARANTEED and therefore we would not recommend that customers specifically book time off work or stay at home specifically awaiting delivery. In the event that you have received a formal dispatch notification and nobody will be at home to take that delivery, you may leave a note to request the driver to leave the delivery with a specific neighbour (which the carriers will routinely attempt if nobody is at home to take the delivery). You may also leave a signed note requesting it be left in a specified safe and dry place but as our deliveries do require a signature we cannot guarantee that the driver would be willing to do this. If this is also not possible then the driver will leave a card with contact details on in order that you may re-arrange delivery on a day to suit or you may arrange to collect the Products from their local depot, should this prove more convenient for you. In the event that the carriers have unsuccessfully attempted delivery and not received contact to re-arrange the delivery or if the carriers are asked to store the Products for more than a few days by the customer then the Products will be returned to ourselves. The Products will then be kept pending payment of an additional delivery charge for a new delivery. Any refunds made in such instances will be made less the carriage return fees. We are unable to re-deliver free of charge as we already subsidise delivery charges and, in addition, we are charged for each failed delivery attempt. Therefore you will be liable for the carriage return costs of £25 on any orders returned to us after a failed delivery. Deliveries can be made at any time from approx 7am and, during busier times, deliveries can be made up to 7pm in the evening. We cannot be held responsible for any losses or expenses occurred as a result of the failure of delivery on the day estimated by us. The next working day service is the service that we choose to utilise in order to provide our customers with more certainty on delivery date - this is not a guaranteed service. The charge we apply for delivery includes the cost of packaging and only a small contribution towards the actual delivery charge which is very heaviliy discounted by ourselves. Delivery charges will therefore not be refunded in the event of any delivery delays. We are unable to guarantee that the driver will be willing to deliver the Products to anywhere other than a ground floor location or to leave without obtaining a signature. The products we sell are also extremely large and heavy (and may therefore not fit in a car should you need to transport between locations) so please bear all of this in mind when ordering. We are unable to recall a delivery once it has left our premises with the carriers and also unable to pass delivery instructions to the carriers once the Products have left our premises and any re-delivery arrangements will be the responsibility of the customer to arrange direct with the carriers. All our dispatches are collected at 7.30am daily by the carriers from our warehouse/factory location (order dispatches are usually sent at least the evening prior to dispatch). All dispatches are therefore labelled, consigned, palletised and shrink-wrapped ready for carrier collection by the preceding evening. Any request to amend delivery details, order cancellations/amendments etc or delivery instructions etc must be received at our offices prior to 4pm (warehouse/factory closure time) on the day prior to dispatch. PLEASE NOTE WE ARE UNABLE TO ARRANGE DELIVERY TO ANYWHERE OTHER THAN MAINLAND UK (EXC SCILLY ISLES & ISLE OF WIGHT) DUE TO EXCESSIVE CARRIAGE CHARGES. 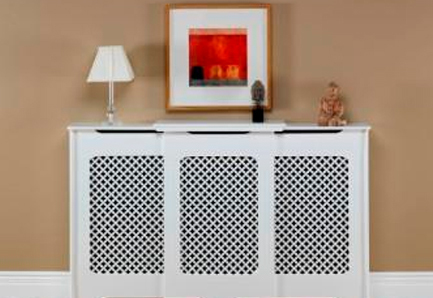 Ready Made Radiator Covers - £9.50 per cover with the exception of the extra large classic cover which has an additional charge due to it's size. All delivery charges are based on Mainland UK delivery only excluding Highlands of Scotland & Scilly/Isle of Wight postcodes where a delivery supplement of 100% and 50% respectively will be automatically added at check-out. We are unable to arrange delivery to anywhere off-shore to Mainland UK (except Scilly/Isle of Wight) due to excessively high carriage costs. Please note that we are unable to provide delivery discounts on rad covers on multiple orders. 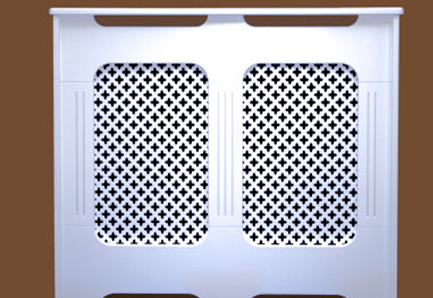 Radiator covers are heavy items (ranging from 1-3m in length and 11kg to 55 kg in weight each) and this is reflected in the carrier charges for delivery. Your confidential information (which includes your credit card information) is sent between your computer and our server in a securely encrypted form which ensures that no other party can read it. Once you have placed items in your shopping basket and proceeded to Checkout you will be required to login with your personal details (ie name, address, email and enter a password). We use Paypal Pro - when you are ready to make your payment, please proceed via the PayPal button, you can pay via your Paypal account or on the second page beneath "Pay with my Paypal account" there is an option to pay with debit/credit card, this is processed by Paypal Pro but no account is required.